8. Statement of Significance The 1976 National Register nomination was largely based upon the Monument's 1975 List of Classified Structures. The only historic resources identified in the nomination are the 192 mounds then known to have existed within the 1476.5 acres of the Monument (96 mounds in the Sny Magill Unit, 67 mounds in the North Unit, and 29 mounds in the South Unit. The nomination specifically identifies the Visitors Center (1962), Superintendent's Residence (1960), Archeologist's Residence (1960) , Utility Building (1960), Pit Toilets (1950), and a Shed (1938) as non-historic structures. Since completion of the 1976 nomination new surveying techniques have resulted in the identification of additional mounds within the Monument's 1975 boundaries. Historic-period resources within the Monument have also been identified. The expansion of the Monument, particularly the acquisition of the 1,045-acre Heritage Addition in 2001, increased the total acreage of the Monument by 71 percent, to a total of 2,521 acres. This land has not been subjected to a systematic cultural resources survey, though at least thirteen historic resources have been identified within the addition. None of these resources have yet been added to the Monuments LCS. As the Historic Resource Study demonstrates, Effigy Mounds National Monument is historically significant for its association with prehistoric Indian Mounds. The Sny Magill Unit of Effigy Mounds National Monument contains what is likely the largest extant concentration of Indian mounds in the country.1 Situated 11 miles south of the Monument's headquarters, the mounds at Sny Magill lack trail facilities, signs, and dense vegetation discourage visitor use in the Sny Magill mounds area. Sny Magill's remote location and lack of trail development makes the site difficult to examine.2 While the 1975 National Register Nomination included the mounds at Sny Magill, since then additional mounds have been identified. The most current count identified 112 mounds at the site.3 On December 15, 2000, the National Park Service acquired the deed to 1,045 acres known as the Heritage Addition. The Heritage Addition contains wetlands, forests, and bluffs along the Yellow River. Thirteen archeological sites have been located scattered throughout the property. These include two well-preserved bear effigies, linear mounds, and habitation sites.4 Additional archeological investigations of the Heritage Addition still need to be conducted. 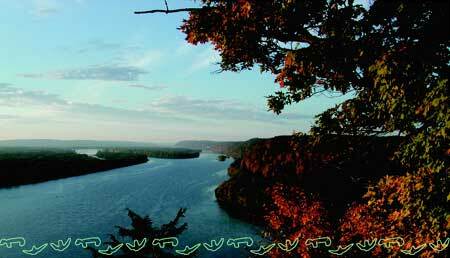 Effigy Mounds National Monument also is historically significant for its association with the early settlement and development of the Upper Mississippi Valley region. Two sites in the Monument serve as important links to the United States' effort to settle northeastern Iowa. The portion of the 1840 military road in Effigy Mounds National Monument is historically significant for its association with the United States Army's effort to resettle and remove local Indian populations in the Upper Mississippi Valley and open the region to white settlement. The second historic resource in the Monument eligible for the National Register of Historic Places is the site of a former sawmill. The site is historically significant for its association with the early settlement and development of the Upper Mississippi Valley. Constructed in 1829, the sawmill was built on the first rapid above the mouth of the Yellow River to saw logs for Fort Crawford in Prairie du Chien, Wisconsin. Both the description (Section 7) and the statement of significance (Section 8) were revised with continuation sheets to provide a fuller narrative of the property's appearance and historical significance. Major bibliographical references (Section 9) were also provided. All of these sections will be included as an addendum to the final report. 1 Beaubien, "Archaeological Investigation of the Sny-Magill Mound Group, 1952," 3. 2 National Park Service, General Management Plan, 1,4. 3 List of Classified Structures, Effigy Mounds National Monument, August 28, 1996. 4 Lenzendorf, Guide to Effigy Mounds National Monument, 81; Michael Maddox, "Lands Added to Effigy Mounds National Monument," January 2001, viewed at http://www.amrivers.org/therivermonitor/effigymounds.htm, on October 16, 2002.